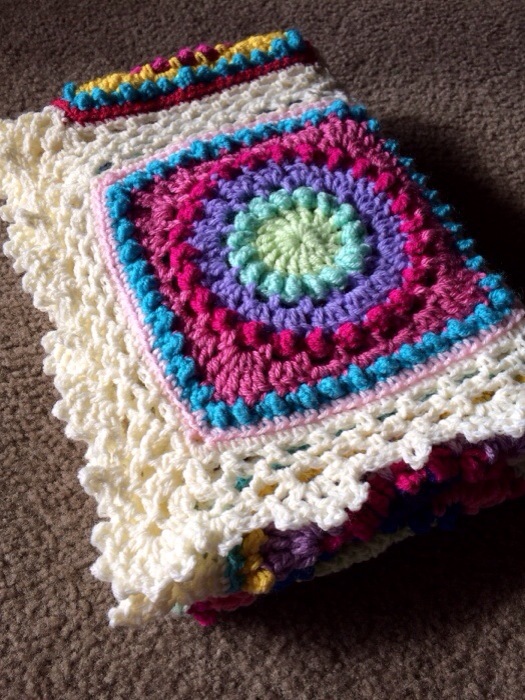 Tummy time has never been better on this bright and cheery piece full of attention-keeping texture. Construction 9″ squares with a lacy join and simple lace border – love! Design Inspiration: Custom request of a bright, funky palette set off by creamy lace! 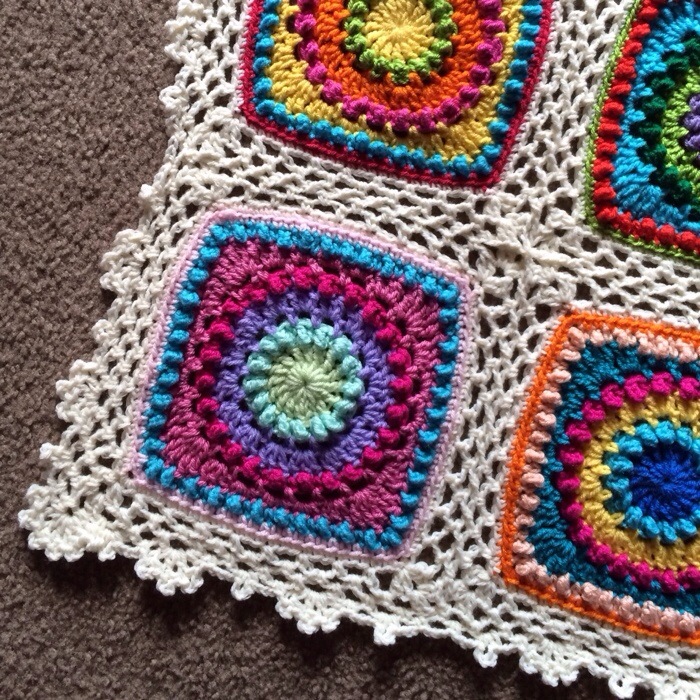 When I first began joining my squares together for this piece, I used my Celtic Lace Join. BUT, that join didn’t lead to the correct final measurement, so I ended up re-designing it for this smaller lace. I also removed the final round of every square to get them smaller. These colors bring me joy! I love working with a bright palette and I always say that brights are in my soul. 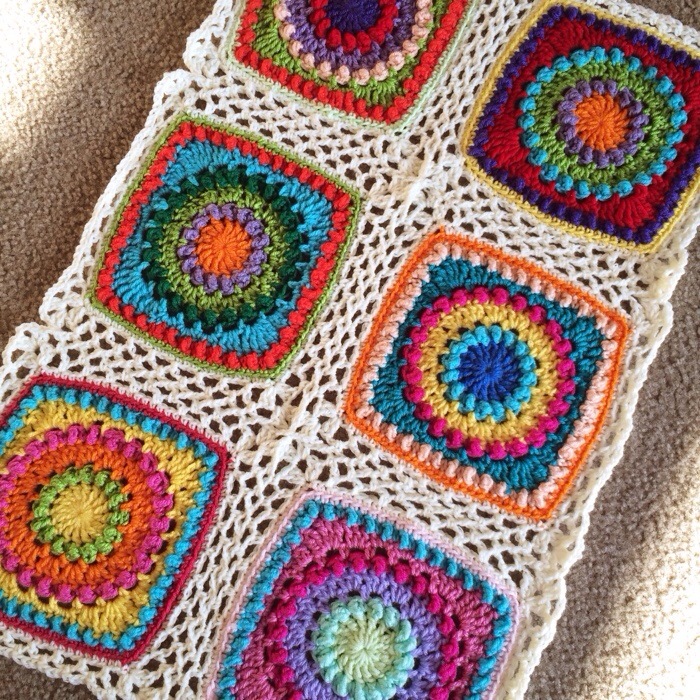 2) Work toward *both* goals of a pretty square and a pretty blanket over-all. Pay attention to both how the square looks and how it contributes to the full piece at all times. 3) If you’re worried about continuity, cohesiveness, and flow, you can use the trick of working two random rounds in a square with the same color. That way, the eye “makes sense” of the mixed up palette. One last thing: Quick thank you to y’all for putting up with my ever-changing website layout! This layout is here to stay – supposedly! Posted in Textured CirclesTagged Circles, Crochet, FBJ, Lace, Motif, Texture, Tip: JoiningBookmark the permalink.